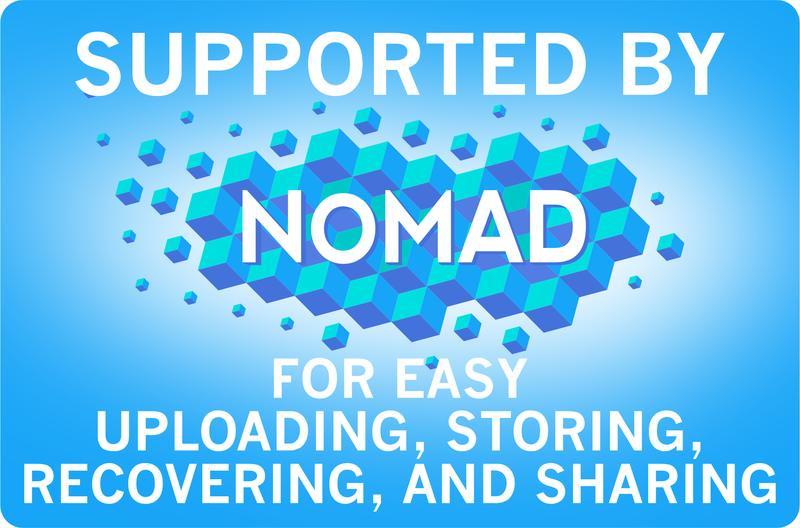 In this tutorial, we use ideas and scripts which are fully described in Volume optimization for cubic systems. Here, we will use these scripts to compare XC functionals, without going into the details of the scripts. 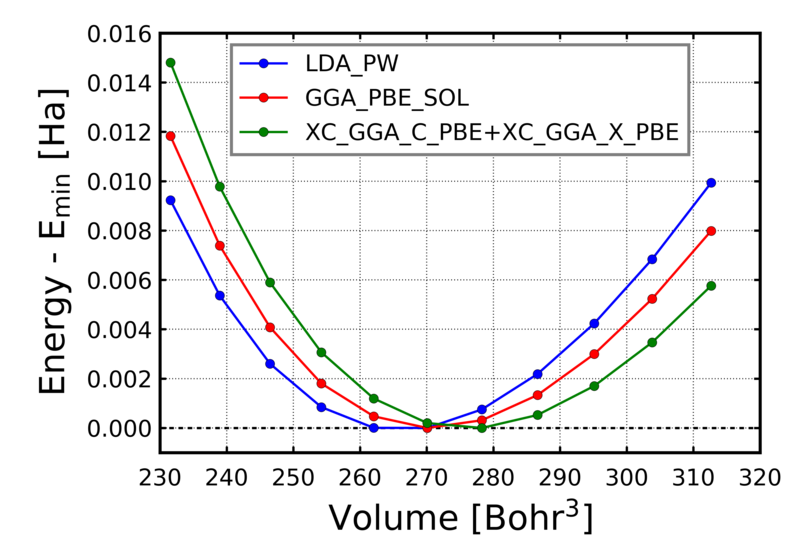 The comparison of results obtained for the equilibrium volume and bulk modulus for different XC functionals gives information on the validity and applicability of the functionals. The parameter xctype specifies the XC functional that will be used in the calculation. In this example, the local spin density approximation (LDA_PW) is used. For further details and pararmeters see Input Reference. Set the correct path for the exciting root directory ($EXCITINGROOT) to the one pointing to the place where the exciting directory is placed. Using the input file created above, you can perform calculations at different volumes for the xctype = "LDA_PW" functional, as you learn more in details in the tutorial Volume optimization for cubic systems. For a given exchenge-correlation functional, the recommended number of volume values for which a calculation should be done is 11. After completing the calculation for the LDA_PW functional, you can investigate other functionals. For instance, you can change in the input file input.xml the value of the attribute xctype to "GGA_PBE_SOL" (general gradient approximation, GGA). Then, you can run exciting as above but changing the directory name to GGA_PBE_SOL, etc. In order to compare the different XC functionals, you may calculate the lattice constant and the bulk modulus by entering the directory related to the exchange-correlation functional you choose and running there the script PLOT-newbirch.py (cf. Volume optimization for cubic systems). Compare your results to the experimental values, which you can obtain, e.g., from the WebElements site. You can also use the Python script PLOT-volumecurves.py for a graphical comparison of the energy-versus-volume values for different functionals. The script will produce the following output on the screen. Enter the names of the working directories. In this example, the input entry is preceded by "directory name: ". The entry values must be typed on the screen and must be the name of the directories which contain your results for different XC functionals. 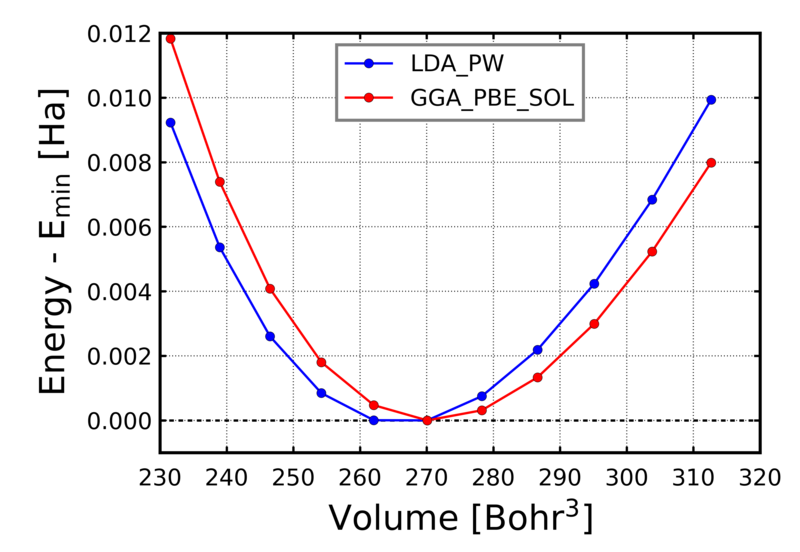 In the example, the first entry contains results obtained using the LDA_PW exchange-correlation functional and the second the ones corresponding to GGA_PBE_SOL calculation. If you enter q, the input will be terminated. The script PLOT-volumecurves.py produces a PostScript (PLOT.eps) and a PNG (PLOT.png) output file, as well as an image on the screen. Using the given example you will obtain the following plot. For a better comparison, the minima of the energy-vs-volume values are shifted to zero.